Building & Construction Solutions | Berg Chilling Systems Inc.
Eco-positive, thermal process management solutions for the global building and construction market. A truly noteworthy cooling solution must be cost-effective, efficient, and robust enough to handle the rigorous demands of the building and construction industry. Today’s building and construction firms demand the highest standards when it comes to evaluation and the production of structures. To exceed customer expectations, maintain cost competitiveness, and meet regulatory requirements, building and construction firms turn to Berg for total chilling solutions. For over 40 years, Berg custom designs industrial process temperature control solutions with chilling, pumping and freezing equipment to achieve precise production conditions, and enable realistic environmental testing of designs and products. Berg works with companies in the building and construction industry to develop custom engineered chilling solutions suitable for their needs. We have expertise in providing shell ice machines that cool concrete for mass pours such as a runway, dams, building foundations and nuclear power plants. For more information on the Berg shell ice machine please watch our video on YouTube. 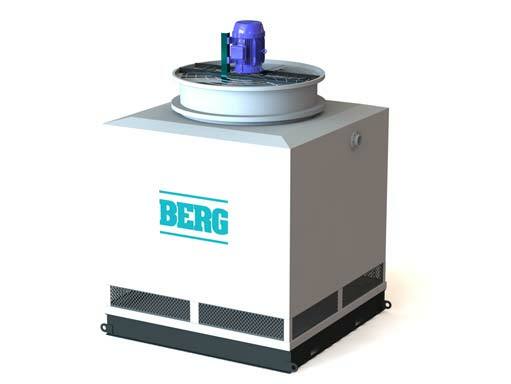 Berg also provides process chilling equipment designed for customer specific applications such as aggregate cooling before batch towers, as well as data center control cooling for the building and construction sector and much more.